Reading Voluntary Action youth project – help iOpener make trails We could use some help putting more trails online – you would be helping by: – Setting up two new trials, one devised by you. 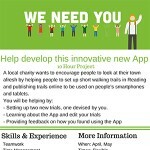 – Learning about the App and editing your trials – Providing feedback on how you found using the App – Contact youth@rva.org.uk You can find out more about this volunteering opportunity here. 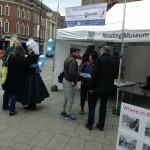 Queen Victoria discussing Reading trails with visitors In Town Hall Square on 21 March, Her Majesty stepped down from her plinth and helped our visitors, explaining about trail making, walking with some around central Reading to take photos, and discussing her subject’s views of their town. Pound the Charity shops A trail around Reading’s pound and charity shops made by a participant on the iOpener day 14 March. Town Hall Square iOpener in Reading’s gazebo in Town Hall Square on Saturday 14 March. Note David’s cunning hoisting method for the banner and the discussion about favourite/least favourite parts of the town centre over our high-tech table cloth map. More on Saturday 21 March. Come along! 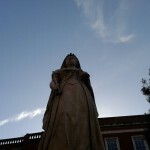 Queen Victoria joins us on 21 March Her Majesty will graciously descend from her plinth in Town Hall Square 11am-3pm Saturday 21 March to join us in learning about trail making using her smartphone. She will be jolly amused. 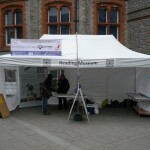 Give her your views on the best/worst of Reading using phone/camera/map & get a voucher for the museum cafe. Trail making 14 & 21 March 2015 – free & fun We’ll be in Town Hall Square Saturday 14 & 21 March 11am-3pm. 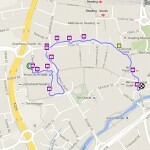 Bring your phones and make an online trail with the ramblr app. 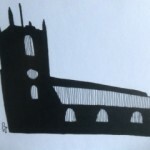 Or just use our paper maps to tell us the best (and worst) about the town.